This ingenious little item really comes in handy. Constructed from 304 stainless steel, Moroso's 280 micron screen mounts on top of spin-on oil filters to trap debris before it reaches vital engine components. Removal allows easy ''early warning'' engine inspections without having to cut open a messy oil filter. Fits Small Block Chevy, Big Block Chevy and 90° V6 Chevy engines used in race, street or fleet use. 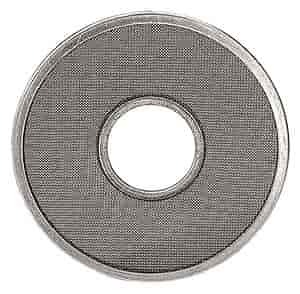 23845 - Moroso Pre-Filter Oil Screen is rated 5.0 out of 5 by 1.